All transactions are safe and secure with a reliable history in online purchasing behind each of our associates. Buy The Goonies Astoria t-shirt to own Goonies clothing and merchandise. Never say die when you're wearing this Astoria Goonies tee, which features a distressed logo for the film on the front. The movie quote, "Never say die" appears below the skull and swords. Wear the T to hang out with your friends or as you fight to protect your own Goon Docks. Who knows, a one-eyed pirate's ship and treasure might be buried nearby. Just be weary of the Fratelli brothers and their mother. They're nothing but trouble. 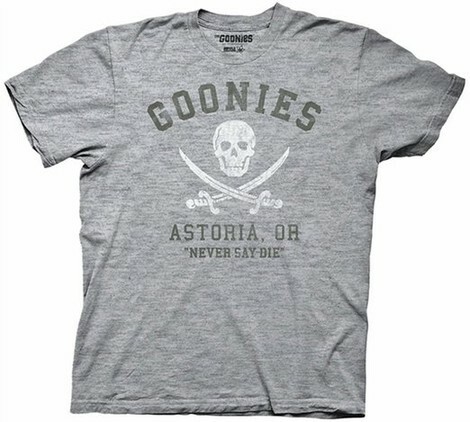 In addition to The Goonies Astoria tee above, browse the Goonies Clothing Gallery for more apparel like men's and women's clothes, kids shirts or hoodies.